Afternoon thunderstorms are a regular feature on summer days in the south of the United States. However, according to a new study these storms do not only bring lightning and thunder, they are also moving considerable quantities of mercury to the ground. The study is published in the Environmental Science and Technology journal, and Assistant Professor of Meteorology Christopher Holmes explains that thunderstorms have a mercury concentration 50% higher than other rain phenomenon. The mercury is being transported into our region by winds, and tall thunderstorms are bringing it down to the earth. Holmes and a team of researchers collected rain samples from a number of locations in Florida, as well as Georgia, Vermont, and Wisconsin. They then linked it to weather data to find out whether the rain was from a thunderstorm or just rain. Radar and satellite data was also utilized to study storm clouds. Clouds are usually only a few kilometers thick in a regular rainstorm, but in a thunderstorm they measure around 15 km in thickness. The team discovered that the rain from the clouds that reached the highest altitudes had more mercury. The highest concentrations occurred during thunderstorms and the lowest during a regular rainstorm. For nearly two decades, the Mercury Deposition Network has recorded mercury content of rain across the country. It was noticed that during this period, the states bordering the Gulf of Mexico consistently recorded the highest mercury deposition in the eastern U.S., which is twice that of the northeast states. 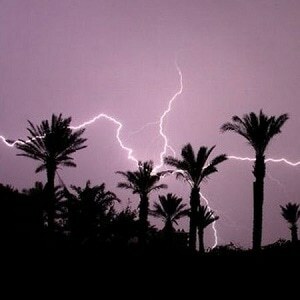 Usually, the Southeast regions witness a high number of thunderstorms during the summer months. Holmes and team believe that this is the explanation as to why the Southeast has higher quantities of mercury in rain. Mercury is a chemical element that occurs naturally. It is used in numerous devices such as thermometers, fluorescent lamps, barometers, and other devices. However, exposure to high mercury levels can be dangerous. As researchers are now aware that the thunderstorms are spreading mercury, Holmes states that they will have to start to understand the reasons behind the presence of the high levels of mercury at these higher altitudes and how it impacts the Earth. We’re trying to understand how mercury enters ecosystems in the U.S. and how it can affect people and wildlife. Holmes’ co-authors on the project are FSU graduate student Nishanth Krishnamurthy and FSU Professor William Landing; Jane Caffrey from the University of West Florida; Eric Edgerton from Atmospheric Research & Analysis Inc.; Kenneth Knapp from the National Oceanic and Atmospheric Administration; and Udaysankar Nair from the University of Alabama. Florida State University, the Electric Power Research Institute and the U.S. Environmental Protection Agency supported this research.